However, there are some caveats to be aware of. 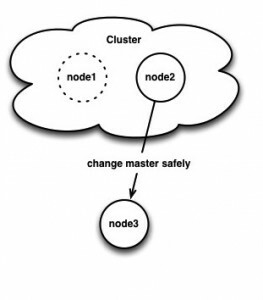 If you slave from a cluster node, there is no built in mechanism to fail that slave over automatically to another master node in your cluster. You cannot assume that the binary log positions are the same on all nodes in your cluster (even if they start binary logging at the same time), so you can’t issue a CHANGE MASTER without knowing the proper binary log position to start at. Until recently, I thought it was not possible to easily do this without scanning both the relay log on the slave and the binary log on the new master and trying to match up the (binary) replication event payloads somehow. It turns out it’s actually quite easy to do without the old master being available and without pausing writes on your cluster. So, with both nodes doing log-bin (and both with log-slave-updates), even though they are on different log files, they still have the same Xid that is very easy to search for. Yes, indeed! We’re assuming the SQL thread on this slave has processed everything in the relay log and, if it has, then we know that the Galera transaction seqno 86277 was the last thing written on the slave. If it hasn’t, you’d have to find the last position applied by the SQL thread using SHOW SLAVE STATUS and find the associated Xid with that position. 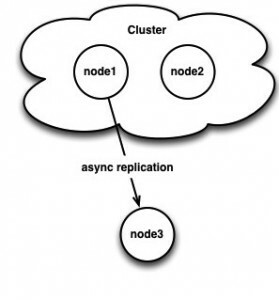 Since our remaining node is non-Primary, we need to bootstrap it first and restart our load. (Note: This is only because it was a 2 node cluster, this is not strictly necessary to do this procedure in general). [root@node2 mysql]# mysql -e "show global status like 'wsrep_last_committed'"
[root@node2 mysql]# mysqlbinlog node2.000002 | grep "Xid = 88085"
Of course, we are still scanning relay logs and binary logs, but matching Xid numbers is a lot easier than trying to match RBR payloads. Those slaves that are also binary logging with log-slave-updates will overwrite Xid, so you this isn’t a true GTID for async in 5.5. It’s even possible to use async replication between galera clusters, but then you need to be aware of a pt-table-checkum/sync bug.